Kerris Roberts is arguably one of the fastest short-distance athletes to ever come out of Iowa. The senior from Waterloo East can boast four State titles between the 100 and 200 Meter Dashes, as well as undefeated seasons and many Drake Relays flags. As one of the top recruits out of Iowa this year, Roberts had a big decision ahead for her collegiate career. 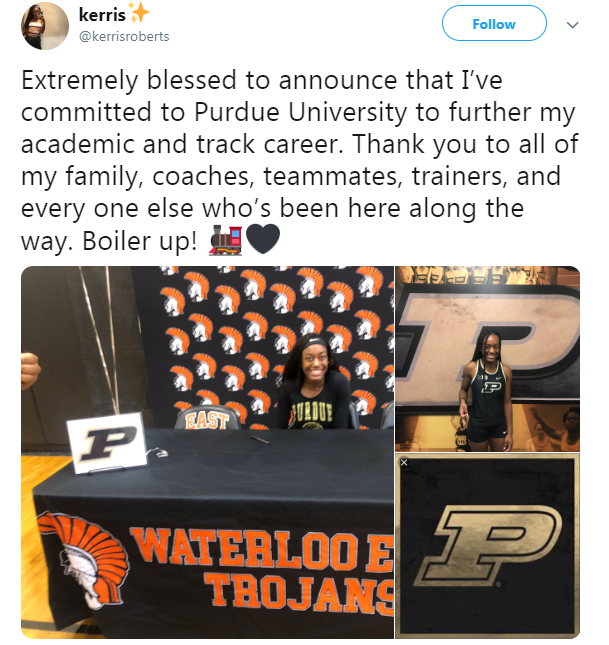 On November 20th at Waterloo East, Roberts revealed she intends to further her academic and athletic career at Purdue University. Check out a Q&A below with Kerris on her tough decision. 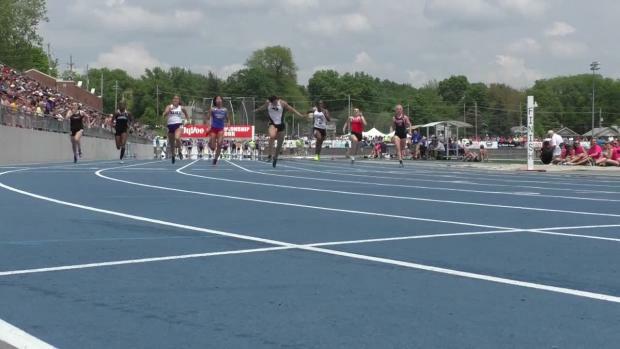 IA MileSplit: What schools were you choosing between? KS: My first problem was deciding if I wanted to go to school and run track, play basketball, or just focus on academics because there were many schools recruiting me for each. Eventually I decided track was going to be the winner so then I had to figure out how far I was comfortable with being from home, which schools had the better track programs, which were the most academically sound, just kind of making a list of pros and cons and weighing my options. MS: How did Purdue become one of your finalists? KS: I already knew Purdue had a great track program and that a degree from there would get me far. Over the months I began to build a relationship with the coach and when I took my visit there and hung out with the team it all just kind of solidified itself. Plus I feel like it's just the right distance from home. MS: Did you take any official visits? If so, where, and how did they go? KS: I took an official visit to the University of Iowa and Purdue, both went extremely well. I had a lot of fun. MS: What are your hopes for your career at Purdue? KS: I hope to just have a great time and make lots of lifelong friendships and memories. Becoming an All-American and national champion is also an aspiration of mine. MS: What do you intend to major in? MS: What advice do you have to other athletes who may want to pursue a big school like Purdue? KS: Once you've set your mind to something, give it 110%; hard work can take you anywhere you want to go. Always remember that school is just as, if not more important than athletics so make sure that you're always staying on top of your grades and performing in the classroom as well as on the court or on the track. Never doubt or limit yourself!